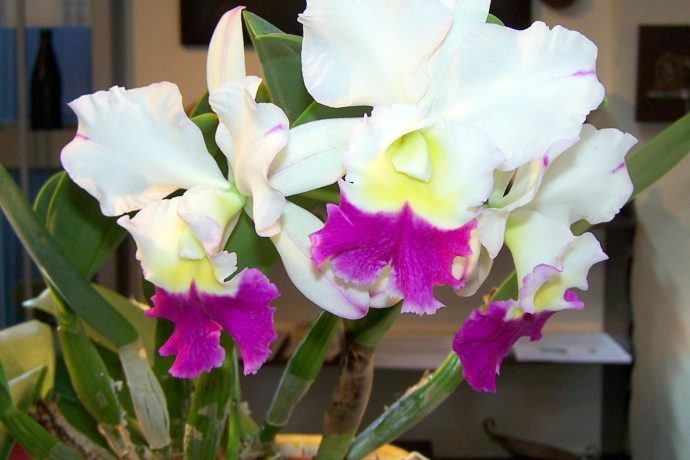 Home / Blog Posts / Info – Real or Fake? Information – Native American Goods, Real or Fake? And, Is a Big Discount Really a Bargain? Turquoise – is it Natural, Treated or Plastic? “Sale! 30% – 75% Off!” Is a Big Discount Really a Bargain? There are contemporary Native American artists producing wonderful works in various media. However, visitors to the Southwest often assume that items that look Native American, are Native American made. Unfortunately, this is not always the case. Many of the baskets offered are only “Southwestern style” and were actually made in Pakistan, Africa, Mexico or China. Some jewelry that looks Native American Indian may be imported from China, India or Mexico. Many weavings are from Mexico. Some of these imports are respectable pieces of hand work in their own right but are a problem if vendors are not honest about the origin. If you are interested in buying authentic Native American art, it is worth understanding the phrases “Indian Hand Made” versus “Indian Hand Crafted.” “Indian Hand Made” should mean that the item was made, basically start to finish, by a Native American. For example, an “Indian Hand Made” pot would be formed by hand and decorated by a Native American. For jewelry, an “Indian Hand Made” piece would be created and any stones set by an Indian artist. A piece of “Indian Hand Crafted” jewelry might contain pre-made components from China, Bali or elsewhere and then put together by a Native American. An “Indian Hand Crafted” pot could mean that an artist purchased “greenware” (a pre-made molded piece) and then decorated it. Know what you are buying. To understand Native American jewelry, the terms used to describe turquoise need to be defined. Stones used in Native American include turquoise of various blues and greens, coral, shell, jet and agates and they range from excellent quality “natural” gem grade stones, to “treated” stones and “imitation” stones which are plastics. Of the turquoise coming out of mines today, only 10% to 15% is a gem grade suitable for jewelry. The most sought after and most valuable turquoise is natural – that means the stone has not been treated in any way, only shaped and polished. Natural stones will usually have a definite “matrix” – bits & pieces of other minerals that occur within turquoise and matrix often adds to a stone’s value. Lower grade stones that are too soft or of poor color, are often “treated” to harden the stone and improve the color. The most common treatment is “stabilization” where a stone is infused with an acrylic to strengthen it. Treated stones (stabilized, dyed, enhanced) have some value as gems, but not at the same level as a good quality natural stone. The least valuable material, often called “block turquoise,” is not a stone at all but a commercially manufactured plastic. These plastics are sometimes described with the name of actual turquoise mine, like Sleeping Beauty or Kingman. The names are deceptive as these mines produce good turquoise but, “Sleeping Beauty block” is only a blue-colored plastic. Another means of producing imitation turquoise is to dye a receptive stone. Howlite, sometimes called “White Buffalo turquoise,” is a stone that is often dyed and sold as turquoise. You can buy plastic block that imitates stones, shells and minerals including turquoise, coral, malachite, agate, jet, lapis lazuli, oyster shell and many more. 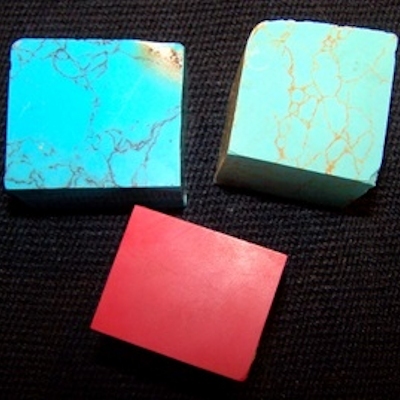 These pieces were labeled “Kingman Turquoise Block,” “Sleeping Beauty Turquoise Block” and “Coral Block.” Plastic feels lighter than an equivalent sized stone would feel, and the color of the plastics is too consistent, too even and the “matrix” is only a line of color – black or brown, dribbled through the base color. The dark red plastic “coral block” does not effectively resemble real coral and plastic cannot replicate the small pale channels that are visible inside real coral. Compare the block samples to the piece of natural turquoise. There’s nothing wrong with purchasing imitation plastic block or anything produced from that, unless a buyer is not aware that they are purchasing plastic. If you buy jewelry, make sure that you know what you’re getting. Discounts – Is a big discount really a bargain? Another current issue is fraudulent advertising and discounting of Native American goods. If you are greeted at the door with offers of high discounts, ask yourself why. Some vendors regularly overprice their merchandise specifically to entice customers with seemingly huge discounts. Check around before you buy – see other prices in the area, how the “sale” compares and if the original marked price suits the quality of the item. According to New Mexico law, “Going Out of Business” sales are only legal for 30 days. Be wary of shops that seem to be “Going Out Of Business” regularly. The U.S. Government and the State of New Mexico are making efforts to ensure the quality and authenticity of Native American art. The authorities recommend that, if you buy, get a written guarantee. Make sure the receipt has the Shop’s name, the owner’s name, address and phone number and ask the seller to describe the item on the receipt, including the maker and origin and, the content of the item (sterling silver, natural turquoise, handspun or commercial yarn, etc. ).